Image caption Awny was Maisie's first creation and reflects her own "fursona"
A 12-year-old girl is hoping to set up a business making furry animal costumes after realising her talent for sewing. Maisie Earl-Tomlinson, from Four Lanes, Cornwall, has been inspired by watching fur suit parades in the United States online. The intricate costumes take several months to make, and are part of a global sub-culture called furry fandom. People called furries meet up online and at conventions in costumes matched to their personalities, or fursonas. "A fursona means something personal to you so like maybe you have the same eye colour or the fur is your favourite colour or it's got the same personality as you or the same name," Maisie said. Maisie says wearing the costumes makes "you feel like a different person". She has plans to go into business, saying: "You have a website and can sell either pre-made fur suits or people can commission you so can send you their fursona or the art that they want you to make." 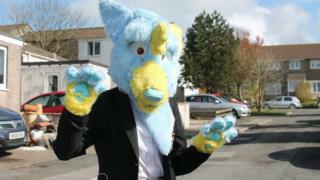 Her first creation was a blue and yellow wolf that reflected her own fursona, called Awny. She has since made a devil-dog called Caz, and is now making a "sassy fox" called Butterscotch for one of her school friends. Her mother Lisa Earl said Maisie spends all of her spare time on her sewing machine: "She's completely self-taught. "She expressed an interest in sewing so we got her a sewing machine and she's just got better and better and better." Maisie says it is a time-consuming hobby: "Awny took me about a month. "Caz took me about three or four months because he was more intricate and Butterscotch has taken about a month so far and will take about another three of four weeks to sew and glue all the fur on."